Are you a Windows Server user or system administrator constantly monitoring Windows operating system updates and looking for innovative solutions for your IT infrastructure? We want to help you gain insight into new storage capabilities in Windows Server 2019. The new version of the Windows server operating system from Microsoft – Windows Server 2019 – has already been released and is being actively used now. To it, a new technology of Storage Migration Service was added, which ensures swift data and servers’ identities migration from old Windows Servers to the new ones. In addition, there are many improvements in Storage Spaces Direct: a new capability of nested resiliency allows maintaining high availability of storage even during multiple hardware failures. Moreover, thanks to the functionality of data deduplication and compression for the ReFS filesystem, you can store up to 10 times more data on the same volume! And let’s not forget about the new features in Storage Replica. All this needs to be known in order to understand whether Windows Server 2019 really gives you what you need for your storage. 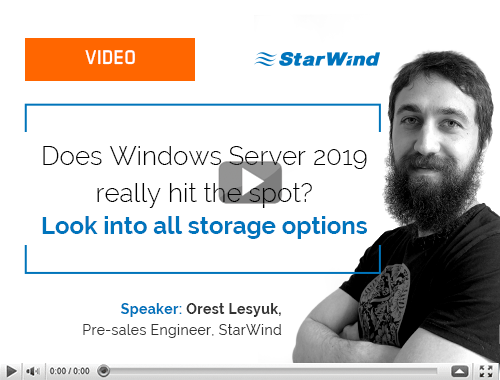 Learn from this video about all updates in storage in Windows Server 2019 and decide for yourself “to be, or not to be” with Windows Server 2019.